There is nothing better than sweating for a good cause. And you can skip your next leg day at the gym! What is Stairing is Caring? Stairing is Caring is a way for people to raise money for good causes. 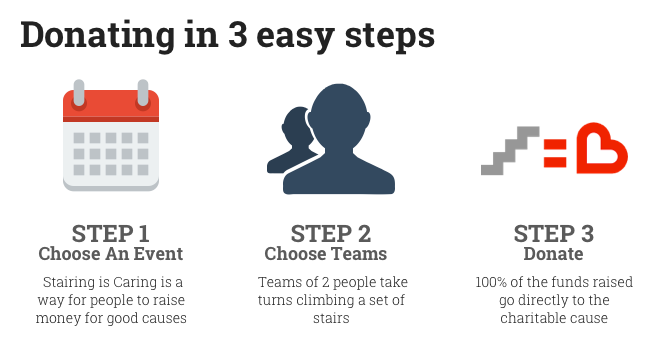 The basic principle is that teams of 2 people take turns climbing a set of stairs. One person goes up and down the stairs, tags their partner, their partner repeats the process, and they do this for 45 minutes. 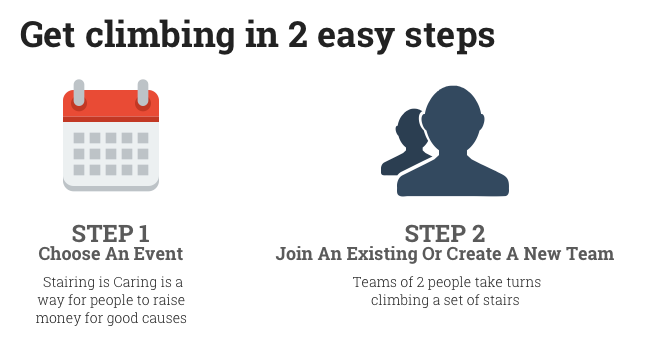 Prior to climbing, the teams of 2 people go out and solicit guesses from their network on how many stairs their duo will climb in 45 minutes. These guesses come with a monetary pledge on the team’s website. 100% of the funds raised go directly to the charitable cause. How Can You Set Up Your Own Event? This site is meant to be a resource for anyone that would like to raise money for a charitable cause. The format of the event itself is meant to be really flexible and easy to duplicate anywhere in the world. All you need is a set of stairs and people that care about a good cause. We’ve raised money for causes ranging from autism, to cancer care research, to domestic violence prevention, to helping fill local food banks. If you have a cause that you’d like to raise money for, follow the Create Your Event prompts under the “Fundraise” call out on the home page.